Kelly Galloup started his fly fishing career at the age of 13, tying flies for the local tackle shop. Kelly has over forty nationally recognized fly patterns. He started guiding at the age of 16 and is still guiding to this day some 30 years later. He owned and operated the Troutsman fly shop in Northern Michigan from 1981 to 2002. In the spring of 2002 he sold the Troutsman and moved to Montana where he and his wife Penny bought the Slide Inn lodge on the Madison River. Kelly Galloup knows how to catch trophy trout, especially with streamers, but not in the way you might think. You'll have to listen in to our show to find out his techniques and strategies. Kelly has written two books and has been published in nearly every major fly fishing periodical in the country. Kelly was also one of the hosts of Fly Fish TV on the Outdoor Life network. Kelly Galloup helps us to understand how cripples and spinners play an important role in the trout’s diet and how to fish them effectively. Learn Kelly's secrets on this show. Kelly Galloup, a professional guide in Montana, talks about high stick nymphing and reading the water. Join us to learn techniques that will fine tune your nymphing presentations and hook you up with more fish. Kelly has written two books Modern Streamers for Trophy Trout and Cripples and Spinners. Kelly has been published in nearly every major fly fishing periodical in the country and is now one of the Editors at Large for Fly Fisherman magazine. Kelly was also one of the hosts of Fly Fish TV on the Outdoor Life Network. 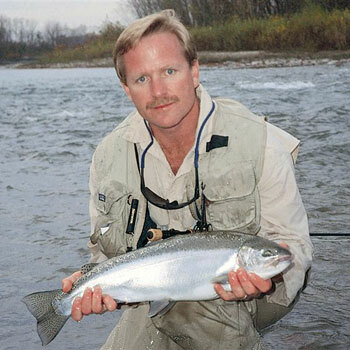 In 2004 Kelly was nominated and received the Living Legend award by the Federation of Flyfishers. For more information on Kelly's fly patterns, lodging and guided trips in Montanta visit his web site at www.slideinn.com.